What Do You Think of iPad App Prices So Far? So the iPad has been out for around 10 days now – and we’ve all done a huge amount of browsing around, installing, and trying out iPad apps right? One thing that was clear as soon as we started seeing iPad apps hit the App Store is that they are priced a fair bit higher than their iPhone counterparts. Many apps seem to be priced right around a mid-point between an iPhone app sort of price and a Mac app’s price point – much like the iPad itself is filling a space between iPhone and laptop / desktop. In just these first 10 days, I’ve paid $19.99 for an essential productivity app (Things) $9.99 for a few top notch games and other ‘serious’ apps, and $4.99 for a number of titles. I’ve asked for and / or accepted very few promo codes thus far for the iPad – largely just out of impatience to get going and trying out a lot of apps I’d been looking forward to seeing on the iPad. — I’m glad to see the higher prices, even though my wallet may not be smiling at me. I’ve always been happy paying for good apps, and I hope that the higher prices bring bigger revenue to deserving developers and help fund more good apps for the iPad and the iPhone platform as a whole. — I expect the higher prices do make for slightly more selective buyers. It seems like a given that there will be fewer impulse purchases in the iPad section of the App Store – at least on titles with steeper prices. — Expectations will be higher to go along with paying more for apps. I doubt that a $9.99 RSS reader app will get the same sort of ‘Well, it was only $3.99’ forgiveness on missing features or similar, that it’s lower-priced iPhone siblings have, for example. — It is lovely seeing some of my iPhone favorites coming out with universal binary versions (that include an iPhone, iPod Touch, and iPad version all rolled into one package). Getting a shiny new (and very impressive) iPad version of 1Password Pro for free, for example, was a very welcome surprise. — Some of the tougher choices for users will come when apps choose not to go the universal binary route, but instead just to produce a beefed-up (hopefully) iPad version. Then you have to weigh up how much better the custom iPad version will be than just a scaled-up iPhone version. I haven’t found many iPhone versions that I enjoy using in their 1X or 2X forms so far. What do you all think of iPad app pricing so far? Have higher-priced apps been proving to be worth it? too expensive in general. iphone i could justify .99 here and there but at 4.99-9.99 a pop i really have to think if i could use it long term. Like you I don't mind paying good money for a well done app. I don't like devs charging me for an app that was just slapped together and ported from the iPhone. Minigore is a great example, the iPad's version was completely redesigned. I think the universal approach is a nice idea unless the app was redesigned. Arse, Minigore is a derived ripp-off of many games, and not that well done. I am happy to pay for what I can see is extra quality btu this is theft. 4.99 for larger graphics, you could do better to by some of those glasses they sell in poundland. Some of the prices for ipad games are way to high, some of them went from .99 Cents to $9.99 and that's a big difference.. I don't think there are any such cases where the game or app remained unchanged, or was just sized up for iPad. At least not any I have noticed as yet – all the $9.99 ones I've seen seem to be custom made, and substantially re-written for, the iPad. I don't mind slightly higher prices for worthy apps. I will, however, be much more selective of the apps I spend money on. Good news for sites such as this! I think Jobs said as much when asked how people find anything useful among the hundreds of thousands of apps. I appreciate those apps that have become universal apps. On the one hand the debs don't owe it to me, but it is more likely I will keep using the app and give it positive word of mouth. Some of these do appear to be money-grabs, but I can also choose to look at the competition. I want to see developers make a decent return for their efforts so the makers of quality apps continue to make them. 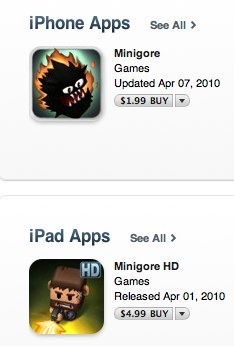 The race to the bottom looks great to the consumers, but not if developers think they can't make money on a $.99 app. If the app is great then I will happily pay "real money" for it. That said, some prices do seem out of whack. I didn't have an iPhone when the app store opened so I can't compare that launch to that of the iPad, but I imagine things won't really shake out until the rest of the world gets their hands on the iPad. Early adopters are more willing to pay more for new apps that show off their shiney new gizmo. Generally, I'm pretty happy with the prices minus a few – and one that comes immediately to mind is Things. Patrick and I chatted about this a little while back. I don't mid that they charge $20… But when you've already forked out $50 for the Mac app and $10 for the iPhone app adding an extra $20 brings us up to $80. Rough on the wallet! There really needs to be a discount for people who owned the prior product – like an update pricing. If there was an upgrade type discount, or a universal binary as 1Password Pro has done, that would be very welcome. having said that, Things is probably my most used app, day in and day out, on iPhone, iPad, and Mac – so I still feel it is well worth the dollars I've put into it. I also don't mind the ipad having higher prices; my concern is paying the higher price for an app that doesn't deliver. Also, I will hesitate to buy an app spontaneously whereas with the iphone apps I viewed .99/1.99 as easy purchases that could be discarded if not satisfied. I would love to see Apple adopt a return policy similar to what exists in the Android Marketplace. It would promote more downloads to try the app without risk. For the apps am interested in, I believe I have been willing to try more expensive apps on Android because of their policy (some were kept and others returned). Yeah – Apple still needs to give us something by way of trialing apps – or more publishers need to go with some sort of spin on the freemium model to accomplish that. I don't know why the iPad apps having higher prices, just because it's larger size?